Demystifying New York Alimony Calculations | Queens Divorce and Family Law Attorney - Divorce/Family Lawyer in Queens - Bruce Feinstein, Esq. Two forms of payment are given from one spouse to another during and after the divorce proceeding: spousal support and spousal maintenance. Temporary spousal maintenance is money awarded or paid while the divorce is pending a final decision. Spousal maintenance goes into effect after the divorce is finalized. These payments can come in the form of alimony, child support, or other types of financial relief. Once spouses start getting into the details of the Court choosing who pays the money, how much is paid, and for how long, things start getting complex. However, it’s easier than it used to be. 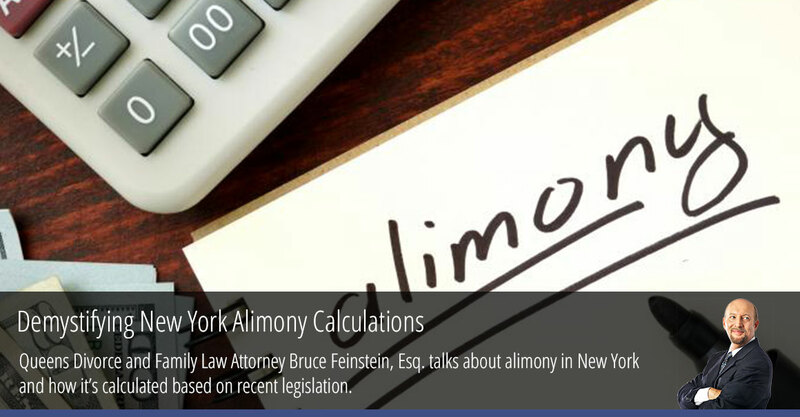 In January 2016, New York passed a new alimony law to address alimony calculations. Previously, New York alimony rules only determined spousal support, and had a laundry list if factors to help decide maintenance. This new law helps decide the length of an ex-spouse’s alimony payments based on how long the marriage lasted, using a combination of a tiered system and the judge’s discretion. One important note is that these formulas are guidelines. They can be changed based on the details of your divorce proceeding. Having an experienced divorce attorney in New York can help you through the details of this process. Now for the math. There are two formulas that determine spousal support and maintenance. In one scenario, the payor spouse is also paying child support. In the other, the payor spouse is either receiving or not paying child support. This helps the Court identify that a spouse who is paying child support has less money for spousal maintenance. The formulas for spousal maintenance have an income cap of $175, 000, which is lower than previous formulas, and are subject to change based on the CPI (consumer price index). These new calculations may seem daunting to the observer, but they give the Court helpful guidelines for determining spousal maintenance. In the past, there were many factors used to determine post-divorce support, but having a concrete formula is more streamlined. It’s also gender neutral, so a female spouse may have child custody but also be paying spousal support. Now that the amount has been set, how long does the payor have to pay the ex-spouse? This is also determined by a tiered formula. For example, marriages that last between 0 and 15 years will have maintenance paid for 15-30% of the length of the marriage. That means that the longer a marriage lasts, the longer the duration of maintenance. This is helpful when a spouse requesting maintenance has stayed home with children or earned substantially less than the other. Having a basic understanding of spousal support and alimony in New York is tricky, but we recommended that our clients do so. Knowledge is a powerful tool to have during the divorce process.